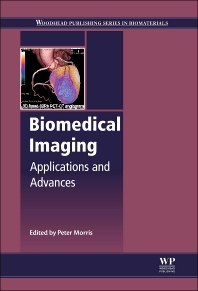 Biomedical Imaging: Applications and Advances discusses the technologies and latest developments in the increasingly important field of imaging techniques for the diagnosis of disease, monitoring of medical implants, and strategies for personalized medicine. Chapters in part one explore the full range of imaging technologies from atomic force microscopy (AFM) to positron emission tomography (PET), as well as the next-generation techniques that could provide the basis for personalized medicine. Part two highlights application-specific biomedical imaging methods, including ophthalmic imaging of ocular circulation, imaging methods for detection of joint degeneration, neural brain activation imaging, and the use of brain imaging to assess post-therapy responses. Further chapters review intravascular, cardiovascular, and whole-body magnetic resonance imaging (MRI). Biomedical Imaging is a technical resource for those concerned with imaging and diagnosis, including materials scientists and engineers as well as clinicians and academics. Peter Morris is Head of Sir Peter Mansfield Magnetic Resonance Centre, Faculty of Science, University of Nottingham, UK.